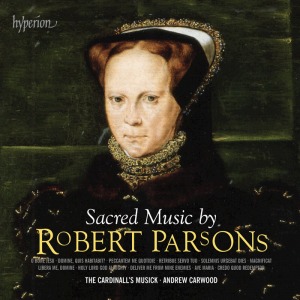 The Cardinall’s Musick continue their recording success with their latest disc of the music of Robert Parsons. Most famous for his setting of the Ave Maria, the recording proves that the composer was far from being a one-hit-wonder! Fabrice Fitch, writing in Gramophone, says “Carwood and his singers make a case for Parsons… it’s worth buying this disc just for this object lesson in word painting…. The Cardinall’s Musick are at their best in this repertoire, and their performances have confidence and authority… Parsons certainly deserves the hearing that Carwood’s musicians afford us, so this addition to the catalogue is very valuable”. Editor James Inverne has gone further, making the disc ‘Editor’s Choice’ in the November issue. Rebecca Taverner from Choir and Organ notes that “the recording has deep perspective and clarity with the sequence of works, mostly scored for low voices, given fluid impassioned readings, with vibrant bass sonorities providing and almost instrumental foundation… tonal beauty, impeccable ensemble and blend”.